It’s a little easy to get templed-out in Vietnam but one temple stood out among the rest. Not for its size and grandeur but for its quaintness. I stumbled on this gem of a temple while following the Lonely Planet walking tour. I was at Nguyen Si street on my way to Dong Xuan market when I suddenly looked left. On a side street, the yellow temple gates peered. I backtracked and went to it. The entire complex was small and seemed squeezed in by taller buildings, not that there were any skyscrapers in the Old Quarter. 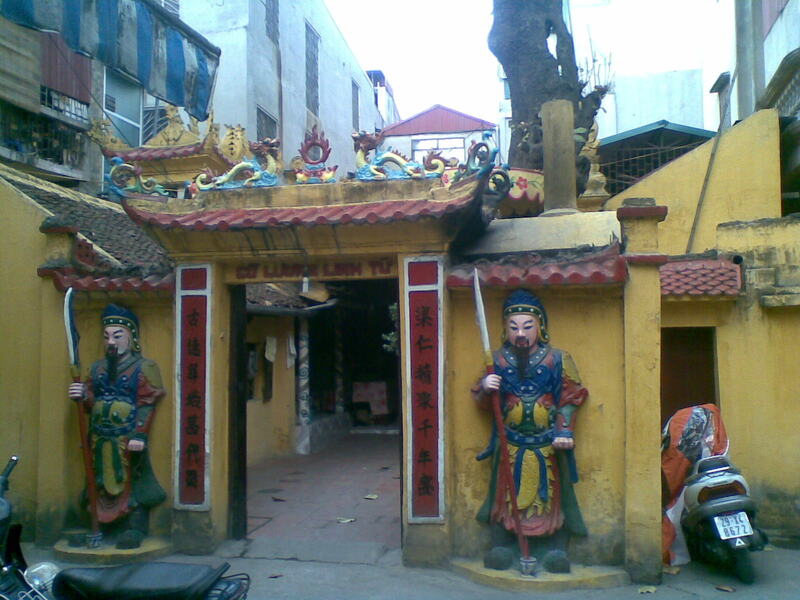 Two warriors guarded the entrance gate of the temple. There were no tour groups nor other tourists inside except for a quiet middle-aged white man who seemed to be drawing the layout of the temple. He started at the main temple room while he drew small squares on a lined notebook. He was probably some scholar interested in temple layouts. I felt so touristy snapping at my camera while he simply looked and drew his squares neatly and quietly. Old women, there were about four of them, were watching television inside. Unlike the faded exterior, the inside seemed a little more modern. Walls and floor were of tiles making it look like an altar was akwardly placed in the middle of a kitchen. There were no joss sticks burning, no whispered favors. The only sound was the Vietnamese chatter coming from the television set. It was quite surreal. 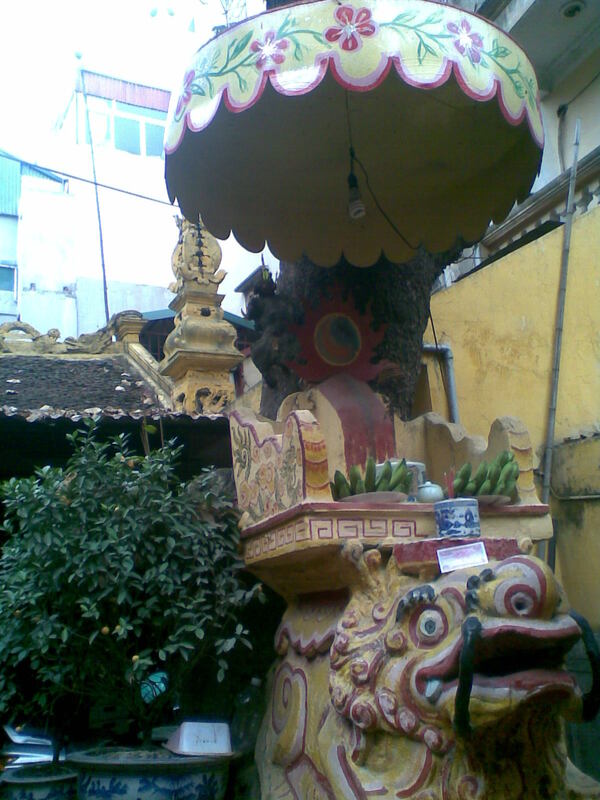 The tiny courtyard held a cute colorful dragon with a small throne perched on its back. Steps behind the tree led to the throne. 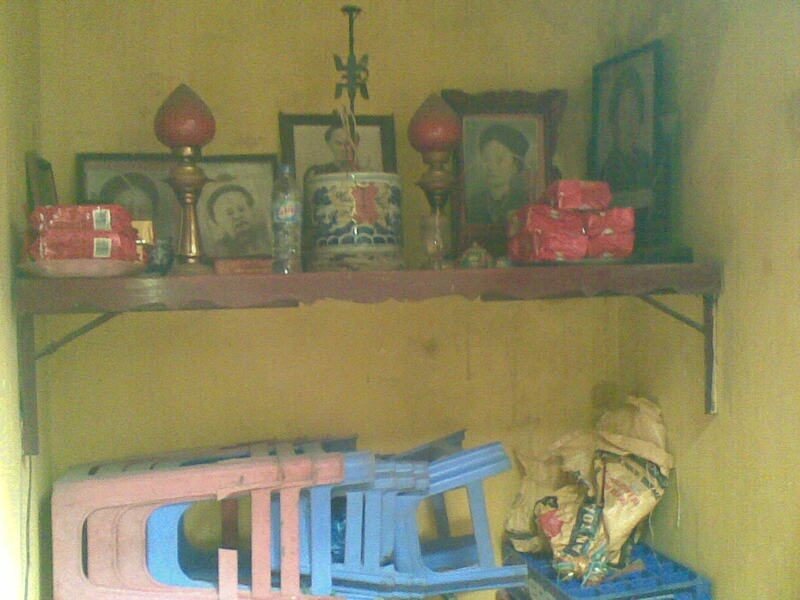 To the left was an altar filled with different dieties, mostly women while opposite it was a family shrine containing pictures of the dearly departed. The drawing man next turned to the altar filled with dieties and continued his squares. There was nothing else to do nor see but the quaintness of the place kept me spell-bounded as if I could not leave. Or perhaps, the drawing man’s scholarly ways kept me from leaving as if I might be missing something. Perhaps, there was something I was missing that’s why he kept drawing those squares in neat grids. 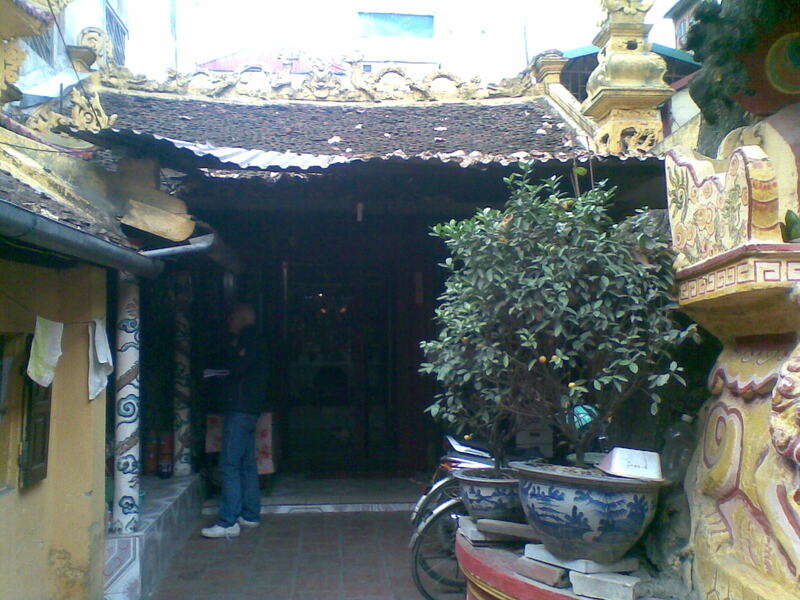 I looked out the gate to the alley I had come in filled with motorbikes and people seated low on chairs gobbling down some hot noodle soup in the cold Hanoi air. 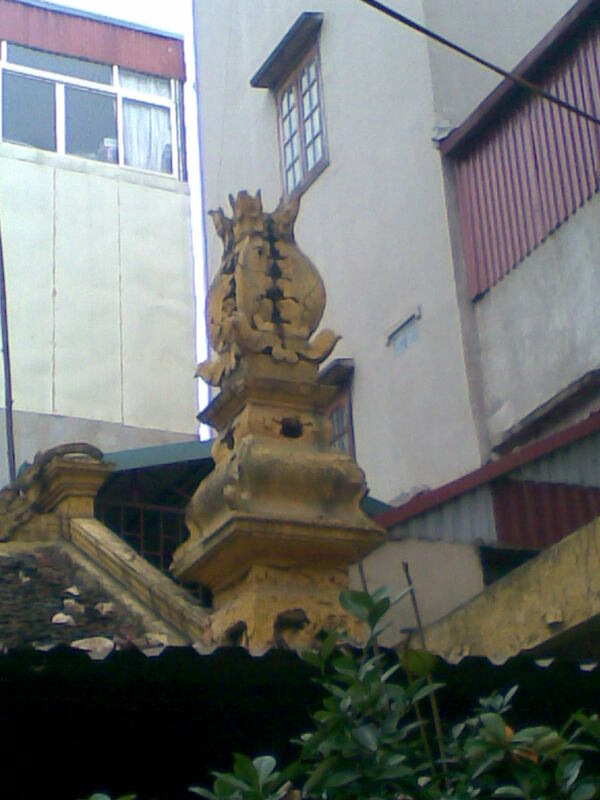 The temple was along a narrow alley lined with what seemed to be low-rise apartments. One of the old women came out of the main temple. She was wrinkled and bent over. “Xin Chao,” I respectfully greeted her. She nodded at me. I decided it was time for me to leave. I quietly slipped out of this quiet piece of heaven and back to the riotous streets of the Old Quarter.